Published: April 10, 2015 at 04:58 p.m. Updated: April 10, 2015 at 11:53 p.m. 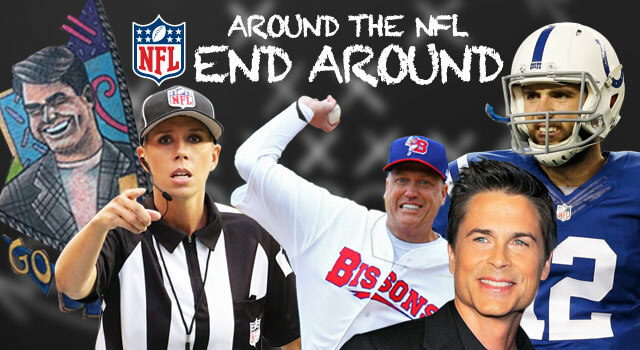 Welcome to the Around The NFL End Around, a weekly-ish look back at the world of the National Football League. Dan Hanzus serves as your guide. 1. Andrew Luck: He can finally rest easy. The Colts picked up his fifth-year option. What kind of contract would Luck get on the open market? Probably all of the money. 2. Female folk: Sarah Thomas is the NFL's first full-time female official. She shouldn't be the only one for long. 3. Jarryd Hayne: Reggie Bush is convinced the Australian-rugby-league-star-turned-NFL-running-back will stick with the 49ers this summer. Let's hope so. America needs a new Australian pop culture deity. 1. Le'Veon Bell: The Steelers running back is facing a three-game suspension for his weed and DUI busts. Belichick is making calls for the Pats to get the Steelers in Week 1. 2. Jameis Winston This felt like a week where the wave of negative press began to build around the Florida State quarterback. 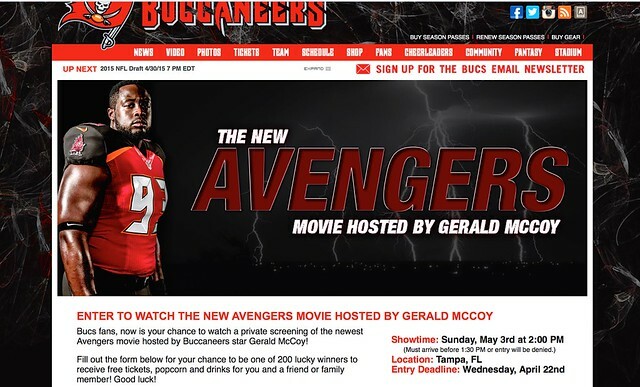 Will the Bucs get scared off? 3. Jimmy Graham: Michael Bennett is still dropping that skyscraper shade on his new teammate. You probably know by now that a young Jim Harbaugh once appeared as a guest star on Saved By The Bell: The New Class (or, as most know it, Saved By The Bell: Hey, Where's Zack And The Gang? And Why's A 35-year-old Screech Hanging Out With Teenagers? And, Wait, Belding's Still There? ... Actually, Yeah, That Makes Sense). Fast forward to the present day. A Michigan fan promised on Twitter that he'd get a tattoo of Harbaugh's Bayside rendezvous if Harbaugh took the coaching job for the Wolverines. That's exactly what happened, of course, and @MarktheNomad kept his word. Props to the ink artist who deftly worked in both elements of The Max and the indelible Saved By The Bell font. That's Ludacris, doing his best impression of Marshawn Lynch. And there's Beast Mode himself, taking a break from his impending Hollywood stardom to make a music video cameo. You gotta give Luda credit. 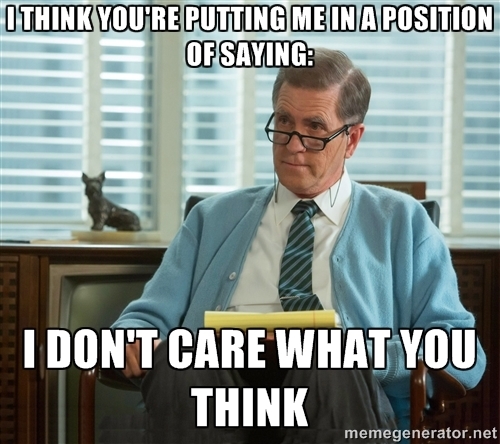 When he released "Blow It Out Your A**" back in '04, I thought to myself, "That is a man who is out of ideas." But here we are a decade later and he's still at it. I guess what I'm trying to say is, congrats on all your success, Ludacris. This is my attempt to be sincere. I just got a kick out of the timing of Flacco's tweet, which came more than a week after Schaub signed with the Ravens. Theory: Flacco is an undercover operative for the U.S. government who missed the initial news of Schaub's signing. Then again, is there a less believable super spy/NFL quarterback than Flacco? Not counting Eli Manning, of course. Eagles defensive end Fletcher Cox is a gear head. The man loves cars, especially the one pictured above, a tricked-out gold Mustang he calls Goldust. Naturally, the hood of the car features an artistic rendering of sexually ambiguous WWE stalwart Goldust. I'm old enough to remember when Goldust was the wildly boring Dustin Rhodes. Anyway, Cox's Instagram features a number of car-themed updates, as well as some slaughtered hogs from successful hunting expeditions. Fletcher Cox would laugh if he felt how soft my hands are. Who will save us from superhero movies? When you think Avengers, what comes to your mind first? Captain America? Iron Man? The Incredible Hulk? Whatever lame-o superhero Jeremy Renner is supposed to be? "I am appalled at the negativity this has generated." -- Dr. Robyn Barbiers, president of the Anti-Cruelty Society, after a football autographed by Bears quarterback Jay Cutler failed to generate a single bid during a charity auction in Chicago. Barbiers added that an anonymous bidder donated $100 in exchange for the football after the event had come to a close. You can go ahead make the joke that Jay Cutler was the anonymous bidder, but just know I'm disappointed in you. Baseball is here. Bills coach Rex Ryan -- a huge fan of the national pastime -- celebrated the occasion by throwing out the first pitch for the Buffalo Bisons, the AAA affiliate of the Toronto Blue Jays. Plenty of people throw out the first pitch. But only an iconoclast like Rex steps off the rubber and looks an imaginary baserunner back to first. It's Easter Sunday which means lots of interesting ways for people to use a religious holiday to thirst trap and glorify themselves on IG. "If you want to be a chiseled 6-foot-6-inch All-Pro football player who makes big money to score touchdowns and win Super Bowls, and if you like to have just as much fun with your family and enjoying life, then this book is for you!" So do we think this quote came from Gronk himself? Or is it someone writing in the voice of Gronk? I'm going to go with the latter, but I would seriously drop the $24.99 if Gronk actually wrote his own book. How great would that be? I would teach my eight-month-old son to read with it. Here's the biggest compliment I can pay to Polamalu, who announced his retirement Thursday after a tremendous 12-season career: He is absolutely one of the faces of his generation of NFL players. When you think of the Polamalu, making acrobatic plays in a Steelers uniform with that crazy hair, he is every bit a signifier of the 2000s NFL as Brady, Manning and Brees. See you in Canton. The NAD, a unit of the Council of Better Business Bureau, has ruled that DirecTV should discontinue their popular (and effective) Rob Lowe ad campaign because, as the bureau sees it, Lowe and his Sub Rob Lowe companions made a series of claims about DirecTV and cable services that could not be substantiated. From The Boston Globe: "The NAD's recommendations included scrapping Lowe's signature line: "Don't be like this me. Get rid of cable and upgrade to DirecTV." The line, the group said, "conveyed a comparative and unsupported superiority message." The NAD also said there was no evidence to back up the claims that DirecTV had greater signal reliability, shorter customer service wait times and better picture and sound quality than cable." Do you know how many awful advertising campaigns sports fans have to put up with to watch the games we love? You guys consistently bury us with Lou Avery-like concepts and execution, then kill the one campaign everyone universally loved. OK, maybe I loved it more than other people, but this aggression will not stand, man. I'll leave you with a collection of all the Sub Rob Lowes in one place. We won't forget you, you sad, depressing monsters. The "Around The League Podcast" is available on iTunes! Click here to listen and subscribe.